I saw the President….in Westminster! Yes I couldn’t believe it really. I know that our location is in the middle of the Capital’s political life and that means we are privileged to see quite a lot. American Presidents are usually cocooned away and with recent events, I fully expected there to be more security than ever before. But hey, ho, next thing we know….it’s Michelle Obama, sitting on our side of the street, giving us a big smile and waving with much enthusiasm as the Presidential limo purred past our side entrance in Storey’s Gate. They were en route to Westminster Abbey where the President was due to lay a wreath on the Tomb of the Unknown Warrior. When George W Bush came here on the last State Visit, he also went to Westminster Abbey via the side of our building in Storey’s Gate. On that occasion not even pedestrians were allowed to cross the road . It had the usual barricades in place to hem everyone in depending on which pavement you happened to be on and you were surrounded by an enormous amount of uniformed Police, not to mention other less obvious security forces. Yes, of course there was a lot of extra police presence this time round. While my colleagues and I stood on our side steps waiting to wave, the ‘men in black’ were obviously eyeing us up behind their dark shades. Guess that this gave them comfort about the threat level. At no time did it feel oppressive and people were walking up and down Storey’s Gate or waiting with their cameras in the most normal way. I am sure Michelle Obama would have loved to have her window wound down to say ‘Hi’ as she waved to our group on the way past. We understood the limits though and went back into the office in high spirits about the whole thing. For once, the general public had been allowed to get as close to the President of the United States as we are allowed to get to our own Head of State, albeit from the other side of armour plating. Also, it was amazing how little disruption was caused to London going about its daily business. They left it to the last minute until roads were closed off or traffic stopped to allow the convoy to pass. Congratulations to the decision makers for keeping the city moving! As we move into June, the pageantry continues as the nation celebrates The Queen’s ‘Official Birthday’ with Trooping The Colour on Horse Guards Parade this Saturday the 11th June. All this week we can hear the sounds of rehearsals and Guards marching from their barracks to the famous parade ground, just across the way from One Great George Street. There is also of course the two spectacular night-time floodlit Beating the Retreat ceremonies too. It is hard to imagine now, that only about 20 years ago, Horse Guards Parade was a car park for Civil Servants. When it was not being used for official occasions such as this of course. Be sure to look out for it next year in the 2012 London Olympic and Paralympic Games. 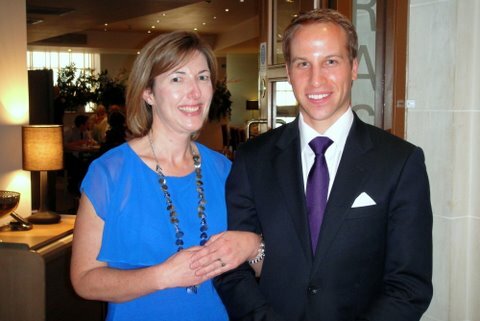 In my last blog I mentioned about Simon Watkinson, the Prince William lookalike civil engineer coming in for lunch, also on 24 May. I had in fact forgotten, not being involved on the day. So, I was a little lost for words when our Sales and Marketing Director, Wendy Greenhalgh brought Simon over to introduce me. Simon does have an uncanny likeness to HRH and obviously chooses his wardrobe carefully. He has also learned to stand with a certain regal poise. I think I was being hesitant in not speaking before being spoken to first! Then I read at the weekend that Prince William was taking part in the rehearsals at last Saturday’s 2nd Dress Rehearsal for Trooping The Colour. HRH was seen later that day in the Royal Box at Epsom where The Queen was running her hopeful filly, Carlton House in the Derby, but which sadly ended third. Before I might have thought he has access to great transport links, but now I’m not so sure…might have to ask Simon if he’s been near Epsom recently. So, 24th May will be a date to remember for some time. Until we meet again…..have a good week.